Cufflinks are among those accessories whose effectiveness is inversely proportional to their size because although they are tiny and often not visible, they contribute a lot to the overall appearance. The right cufflinks at the right time can give an outfit the decisive touch. Wrong cufflinks or even good cufflinks for the wrong occasion can spoil an entire elevator. Cufflinks are usually worn only on shirts with double cuffs – also called folding cuff – or to dress shirts, the cuffs are not working, but still have no buttons. This rule may sound banal but has its sad justification. There are shirts with simple button cuffs, which in addition to the button also have a hole for the cufflink. This so-called combination cuff is nothing half and nothing whole because cufflinks belong to hinged cuffs. If you do not like cufflinks, you should prefer shirts with simple button cuffs. 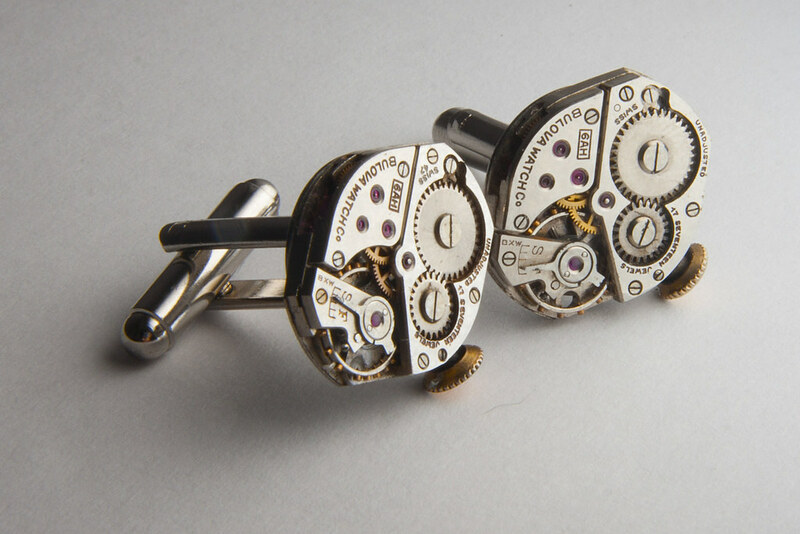 A cufflink consists of two identical objects designed to fit through the buttonholes of the cuff and connected by a web, a chain or an elastic band. There are also snap fasteners, connectors or screw threads, but usually, a small chain connects the two objects. These are usually flat ovals of gold or silver, which can also be studded with gemstones. There are also colored enameled cufflinks. In addition to the flat links, oval shape representational replicas are offered, such as golden teddy bears, dogs, dice, and horses. In other words, anything artistic that can be put through a buttonhole. Some people turn their heritage jewelry into cufflinks – earrings are great for that because they appear in pairs. Also very popular are the already mentioned fabric nodules, which look like small braided balls. They are available in one or more colors, their low price allows for every conceivable combination of a jacket, trousers, a shirt, and a tie to have the right color in the closet. Originally, they were probably a kind of placeholder, which the customer replaced after buying the shirt with his own, more valuable cufflinks. Today, cufflinks are both a popular accessory that can be perfectly matched in color to the rest of the outfit, as well as a good interim solution for those who have no other cufflinks. And when can cufflinks be worn now? Whenever you wear a shirt with folding cuffs. And shirts with a folding cuff suit almost anything, a suit, a sports jacket and a blazer. Nonetheless, hinged cuffs for sports suits and jackets are rather uncommon, but certainly not a faux pas. As a rule of thumb, it could be said that folding cufflinks are no longer appropriate when the shirt is worn to suit, sports jackets or blazers without a tie. But that too is left to the individual style feeling. Only those who wear button-down shirts with soft roll collars have to do without cufflinks because these American classics are only available with button cuffs. Whether cufflinks should be worn for a sporty outfit also depends on whether they are overdressed or not unless, of course, you look for the contrast from the outset and consciously wear gold cufflinks with jeans and loafers. When choosing the cufflinks, also take into account what kind of jewelry you are looking to include in your outfit. Of course, it cannot be so general to decide whether a watch made of stainless steel can or cannot be worn with golden cufflinks. But the effect of the timepiece of rings, rings, and cufflinks should be considered. It counts every detail – even if it is as small as a cufflink.